Travel with a purpose makes it more exciting, fun and interesting, whether you're on an antique junket, looking for art or exploring local food. If you ask a group of New Mexicans where to find the best green chile cheese burger, you better have time for a long discussion. On this subject, every single resident in the state has an opinion. We seek out this passion in a state, region or country's for their special food. And it's always a treat to check it out, sampling new foods is a wonderful adventure. So, without further preamble, here's our top three in the SW region of New Mexico's. And, please note, in New Mexico it's chile, not chili. just two miles from the Mexican border. Historic, tiny Columbus, “Where old Mexico meets New Mexico,” boasts a few eateries and a friendly population. 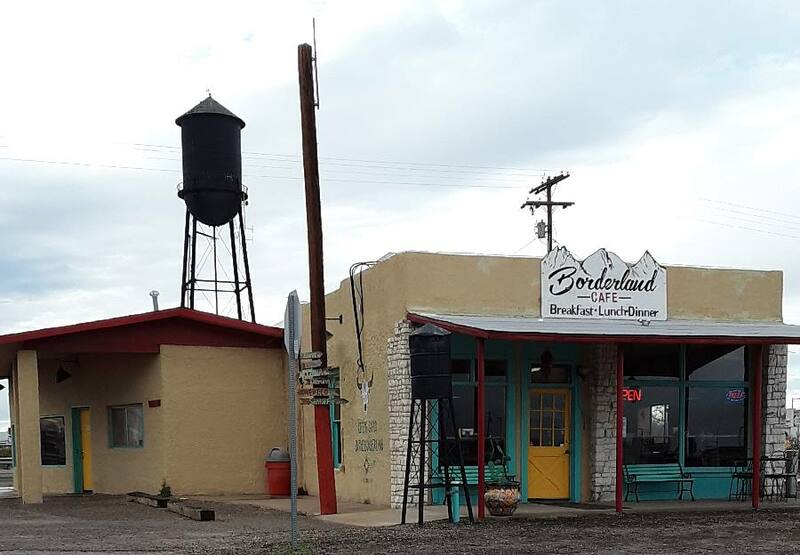 The Borderland Cafe, a couple of miles from the border, opposite the museum and Pancho Villa State Park is small, functional and open Monday – Saturday. It's run by a young couple, Lawrence & Adriana Haddad, and it's proving to be very popular, with good reason. The food and the service is excellent. Their burger is superb, but so is their chicken fajita quesadilla. They make their green chile sauce from scratch and it is delicious. I asked if they bottled and sold their sauce. They don't but I keep hoping they will one day. It's spicy, delicate and creamy. Utterly scrumptious. We've eaten there a few times now to double check, just had to be sure, you know how it is. Do not miss having their cucmber limeade to drink. This was hands down the best burger we ate. 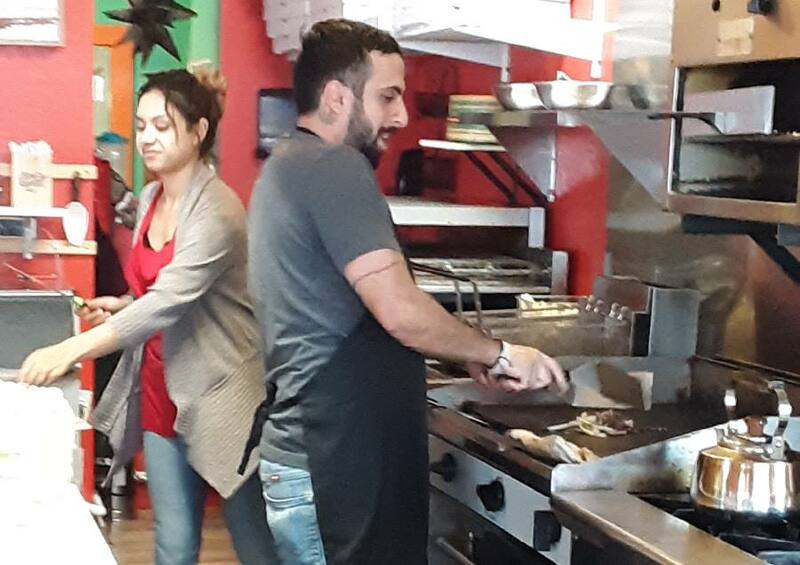 Owner and chef, Lawrence Hadded, works the kitchen at Borderland Cafe in Columbus, NM. 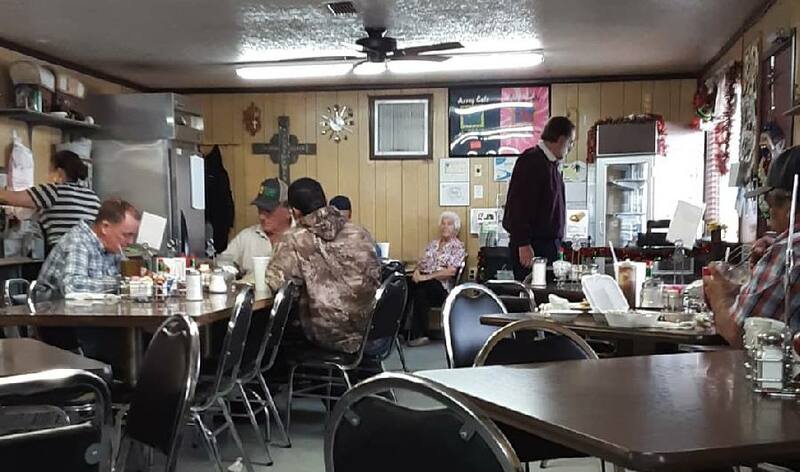 A visit to Sparkey's in Hatch is an old New Mexico tradition. They're only open Thursday – Saturday. The line outside can be long, so we waited until about 2.30 p.m., on a Saturday afternoon before going there. There were still lots of people but not a long wait. Decor is strictly old school ... large dolls bearing hamburgers line the roof of the building, the aroma drifting around the back parking lot gets the juices going. Inside the place oozes atmosphere, the walls and ceiling are cluttered with old time vending machines, road side signs, old dressers, bits of juke boxes, you name it and you will probably find it. The band was belting out oldies, the rooms were filled but not overflowing and savouring the aroma, we sat down to sample the burger. It was good. Yes indeed, it was. The chile sauce was good. 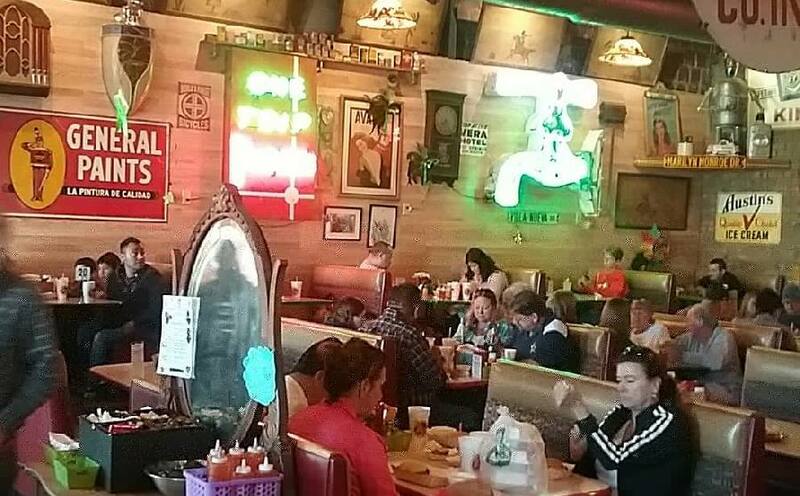 You'll enjoy a good burger and a lively, fun atmosphere. Hatch, NM Home to the brash, fun and very popular Sparky's is a New Mexico tradition. 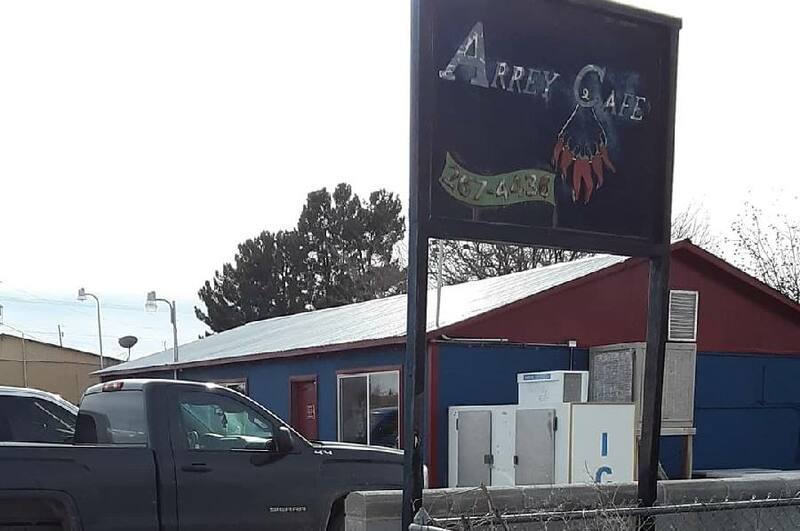 Definitely tucked down a back road, or byway, is the Arrey Cafe in the tiny hamlet of Arrey, south of Truth or Consequences. The whole place is a rustic delight. It's open open Monday – Saturday and the clientele is mostly local. You're greeted with a warm welcome and heaped plates. We made the mistake of ordering a loaded burrito and the burger. It was enough to feed four people easily! But – it was very good. The burrito was loaded and the green chile cheese burger totally delicious. Their green chile sauce is good – hot and spicy but doesn't take the roof off your mouth. The down home atmosphere of Arrey Cafe attracts locals and visitors alike. We've only just begun. 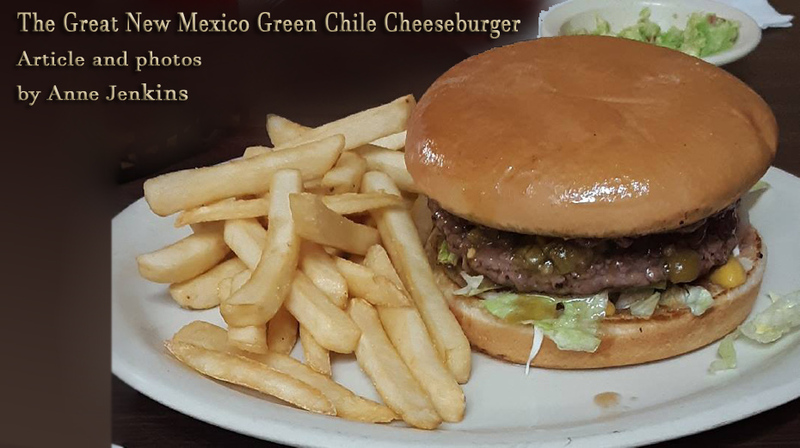 We'll be scouring the towns and back roads looking for more green chile cheeseburger delights throughout this beautiful, diverse and friendly state. Exploring New Mexico's varied landscapes, long history and great food is a treat any time.